I’m aware that I’m not the only one commenting on the vocal fireworks display put on by Ms. Aguilera at the Super Bowl that ultimately was an equally shining example of style over substance. Known for her supernatural singing talent and incredible feats of vocal ability, she has perfected melismatic singing (which is the style of singing that so many R&B singers employ – and almost every American Idol wanna be, which is the singing of multiple notes over one syllable). Most people would consider it just “runs” but in fact the style is called melisma – or what I call it – oversinging. But getting back to the point of this post. 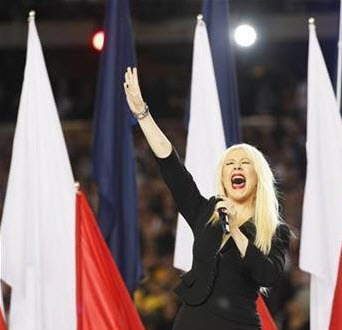 Although Ms. Aquilera has sung the anthem countless numbers of times over her career and despite the fact that the Star Spangled Banner is considered one of the hardest songs to sing (lyrically, sonically and performance-wise – which is typically in a large echo-ey stadium/arena) – she so over-delivered on the style while flubbing the essence of the song’s meaning – which is predicated on the lyrics. Had she been trying out during Hollywood Week on Idol (where the standing rule is “don’t forget the words) – Christina Aguilera move have been kicked-off. I’m not a die-hard patriot who holds the anthem sacred but it irks me that she’s being paid to deliver the song and what she provided was a wrenchingly over-sung version that transformed the song into a melodically unrecognizable series of vocal runs stitched together into one auditory splurge of sound that was – in the end – sung incorrectly. A teachable moment… get the basics down first before you try to impress and add your own flourishes. I’m all for originality and bringing one’s own style to anything/everything one does but not at the cost of f**king-up the words.